Description: Previously unreleased recordings by Eric Dolphy from 1963! This Marshmallow release in its Historical Series features Eric Dolphy's previously unreleased studio recordings from the so-called "Douglas Sessions," supposedly produced by Alan Douglas who was an A&R man for United Artists. Some materials from these sessions have been released over the years from several different labels, including the album Conversations from the FM label and Iron Man from the Douglas label. Tracks 1 and 3-5 are previously unreleased alternate takes from these sessions, and Track 2 is a newly discovered tune that was supposedly "rejected" and therefore thought to have been erased. The album opens with two stunning duo performances by Dolphy and bassist Richard Davis. Their interplay is intimate and at times telepathetic. "Iron Man" and "Mandrake" are played by a quintet featuring Woody Shaw on trumpet and Bobby Hutcherson on vibraphone. "Love Me" is a searing alto sax solo performance by Dolphy. 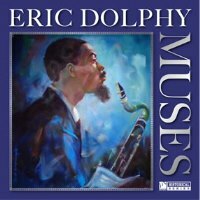 This is a fantastic release for fans of Eric Dolphy! Recorded in July 1963 in New York. Mono.